a variety of fun and safe activities for children and their families to enjoy. Volunteers are welcome! 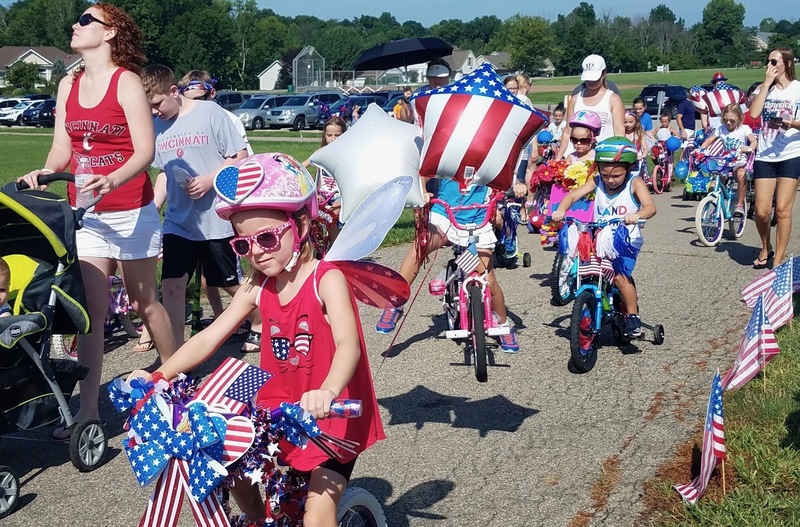 Thank you to everyone who participated in this year’s INDEPENDENCE BIKE PARADE. October is always the busiest month of the year for the Children’s Committee, and this year was no exception! Not only is it our busiest, we also host two of our largest events. This year we were very fortunate to have great weather for both! It is always amazing how much time and effort our residents along the route put into this hayride. These people do this on their own dime, and we can’t thank them enough. This year we split the prize money for best house among the residents of Cravenhurst. Every year they come together to make an awesome display! Each resident on Cravenhurst that participated got a $50 Visa gift card. Thank you to ALL the residents that volunteer to do this each year! This year Sherilyn Reynolds and her team at Caldwell Bankers Real Estate sponsored the hayride. They donated $150 to go towards the drivers gas cards. THANK YOU!! Floyd Ogden and VRUC for allowing us to use their generator. The HVL Maintenance team for helping before and after with hay, garbage cans, cones, tables. Etc. Eric Johnson, and Eric Airgood for all your help before, during and after the hayride. Anyone else that helped but we forgot to mention! We have a GREAT community and so many of you made this event happen. THANK YOU for stepping up! And finally, the Children’s Committee who worked MANY hours to make the event happen! We had a great day for our annual Halloween walk on Sunday, October 21st. We had lots of kids and their families join us and show off their costumes to get some Halloween treats. 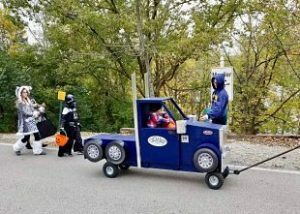 Kids age 10 and under were invited to collect candy and other goodies from 50 stations along Longview. And special guests Rosie Red and Mr. Reglegs joined in on the fun! We had a great time and hope everyone else did too! Thank you so much to Paige Wurtz for helping organization the event, and to all the residents on Longview, the Bright Fire Department, and all the volunteers who passed out candy! 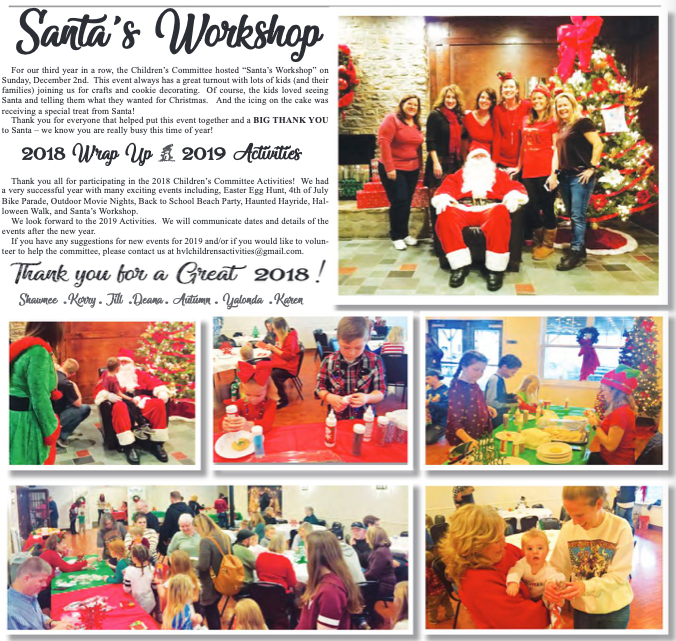 Last event of the year – Santa’s Workshop! On Sunday, December 2ndthe event will be held in Willies basement from 2-4pm. During this time, families are welcome to come anytime (similar to an Open House) and see Santa. We will have cookies to decorate along with a drink (juice & water), a craft to make, and a special gift from Santa. Bring your own camera and take pictures of your child(ren) with Santa. The great thing is, since it is an event where people can come and go, we are not limited in the number of people that come like years past! However, YOU MUST RSVP so we can prepare and manage the event appropriately. Cost is $3 per child age 1-10. Children older than age 10 are welcome to get a picture with their younger siblings/families for no additional cost. Send an email to hvlchildrenscommittee@gmail.com with the names and ages of the children. We will confirm your reservation and provide instructions on how to pay. 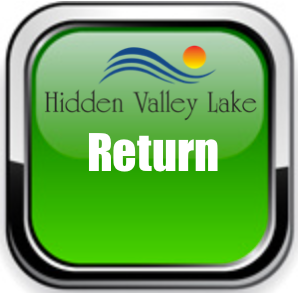 Private message us on our facebook page (Hidden Valley Lake Childrens Committee). We will confirm your reservation and provide instructions on how to pay. Buy your wristband and confirm your spot ahead of time! Date/time will be determined soon. As always, if you would like to volunteer to help with any of our events, or if you have any ideas or questions, please contact us at hvlchildrensactivities@gmail.com. 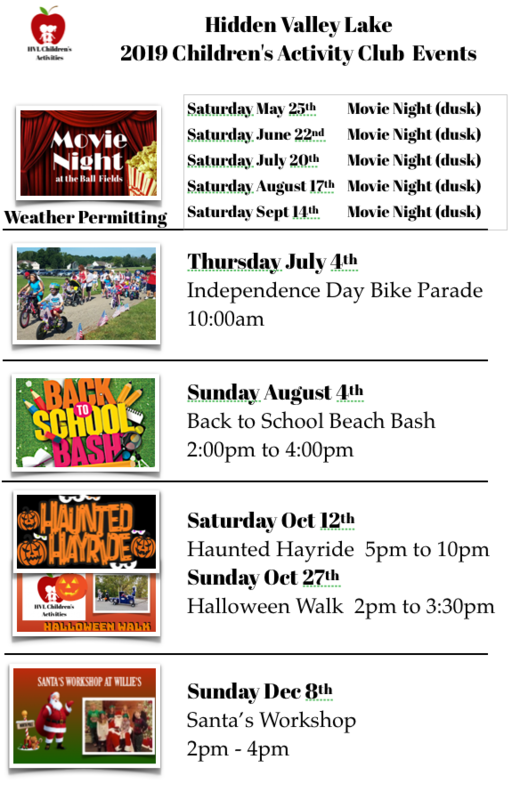 View the HVL Events Calendar. Outdoor Movie Night: Saturday, June 9th FREE EVENT! Independence Day Bike Parade: Wednesday, July 4th FREE EVENT! Outdoor Movie Night: Saturday, July 21st FREE EVENT! Back to School Beach Bash: Sunday, August 12th FREE EVENT! Outdoor Movie Night: Saturday, August 25th FREE EVENT! Outdoor Movie Night: Saturday, September 15th FREE EVENT!